The Khao Phansa festival marks the beginning of Buddhist Lent, the annual three months rains retreat for monastics, which begins the day after the full moon of the eighth month on lunar calendar. The specific dates vary depending on when the full moon of the eighth month is, which in most years it is in July. The Khao Phansa is the traditional three month "rains retreat" during which Buddhist monks are expected to stay in their own temple to study the Buddha’s teaching as well as meditating. They are not allowed to travel and stay overnight out of their temples, but under certain circumstances, such as visiting a sick relative, they maybe given a leave period of up to seven days. During this three months retreat monks are not allow to revert to being laymen. Lay Buddhists all over the country observe the day (the first day of Buddhist Lent) by gathering in the temple to pay homage to the Buddha, listen to Buddhist teaching accompanied by offerings of food, flowers, incense, candles and other items necessary for every use for the monks. According to legend Buddha’s followers did not stop their wandering during the rainy season and people began to complain that they were trampling on the rice fields and worried they might damage seedlings or small creatures in the fields. When the Buddha heard these worries he forbade the monks to leave their temples for three months. During this time devout people often abstain from alcohol. They pray for assistance and guidance to encourage merit and happiness in their lives. It encourages them to follow the five major Buddhist precepts: don’t kill animals; don’t steal or engage in corrupt acts; don’t commit adultery; don’t lie; and avoid drinking alcohol. Many take time away from work to make merit for deceased relatives. They also offer robes to the monks. 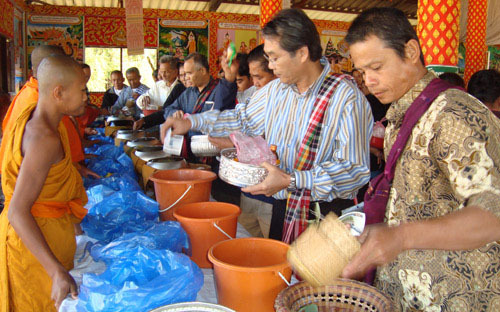 Early the morning of the day of Khao Phansa festival, people prepare donations of food (particularly khaotom, rice, banana or pork wrapped in banana leaves) and necessities like soap, toothpaste and toothbrushes and towels for the monks. Most temples are very busy during this time with people making merit and giving their donations. At the end of these merit-making activities the monks will recite the teachings of Buddha and tell the history of Lent to temple goers. Later in the evening monks, novices and laypeople bring flowers and candles and walk around the central temple three times. 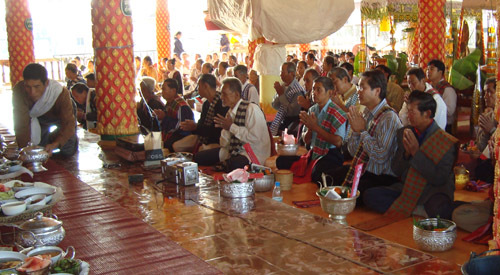 These are the most usual months for ordination and for men to enter the monkhood for short periods and are marked by numerous ordination ceremonies. In Lao tradition lay people do not get married during this three months Buddhist lent or Khao Phansa.